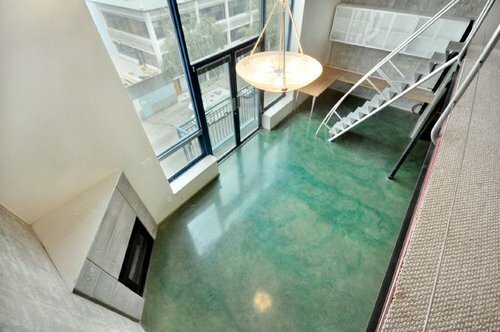 Unique live/work loft at 2001 Wall St. 943 sq.ft. listed at $379,000. 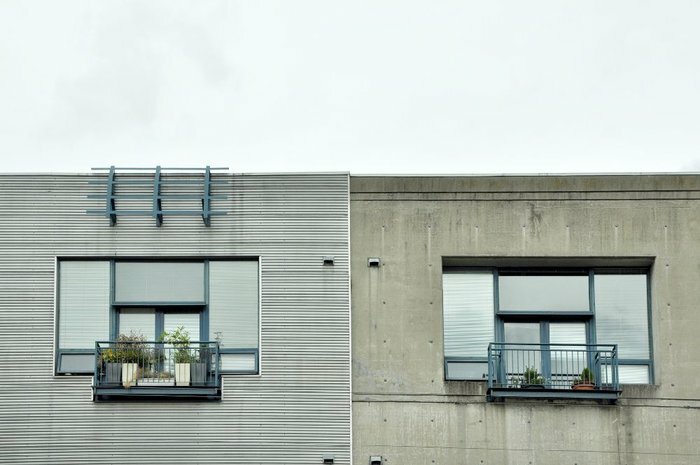 ARE YOU PLANNING ON SELLING YOUR LOFT? If you are planning on selling your loft, we would be glad to help. Our advanced marketing plan, network of loft cilents, and level of service make the process simple for you. We get the property properly marketed in front of the right audience right away. Contact Paul Albrighton for more information about selling your loft in today's market. This industrial style loft gives you the true loft experience. There are no "condo" gimmicks with this property, just open space and lots of concrete. Located near the Port outside of of Ralitown, this solid built two level loft gives you plenty of flexiblity for your living or live/work ideas. Upstairs has plenty of room for a master bedroom, walk-in den/closet, and either a work area or second bedroom. See the floor plan here. ABOVE: Cannery Row has a green open courtyard between the "rows" of lofts. This building has a great community feeling. Paul Albrighton can act as your buyers agent. Feel free to contact me. Wall Financials newest development. 2300 Kingsway and The Eldorado. Top floor of 9 story concrete building. 623 sq.ft. Modern finishing, great value. Completing in 2013. 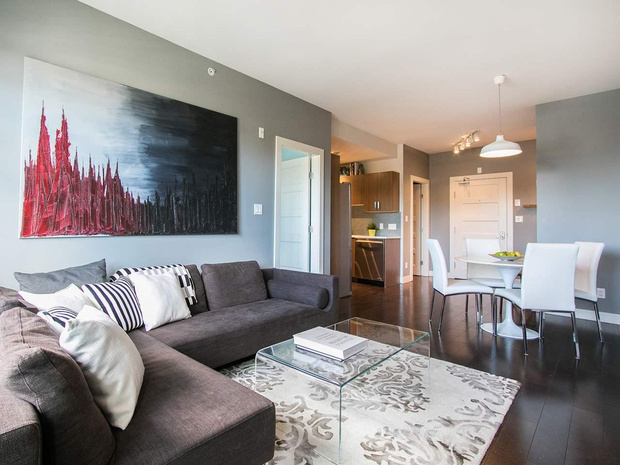 "THE ELDORADO", exclusive 80 homes in a CONCRETE MID RISE managed by Wall Group of Companies. Architecturally stunning concrete vertical lines and elegant steel construction create striking street level impact. Culturally diverse Renfrew-Collingwood neighborhood includes Norquay Village shopping and choice Vancouver restaurants. Close to schools, transit and 15 minutes to Downtown. $305,000. 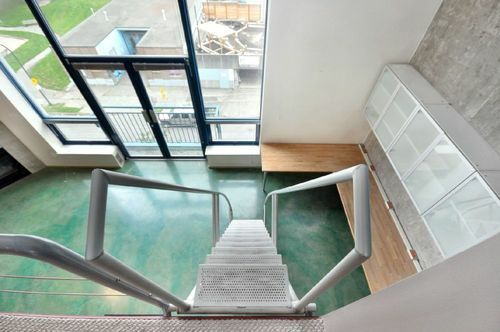 This unique Vancouver loft building offer two level concrete live/work lofts in a industrial setting. Some suites have great views of the rail yards, ocean and Mountains. Located at the Edge of town in the heart of industrial buildings, Cannery Row offers living like no other. 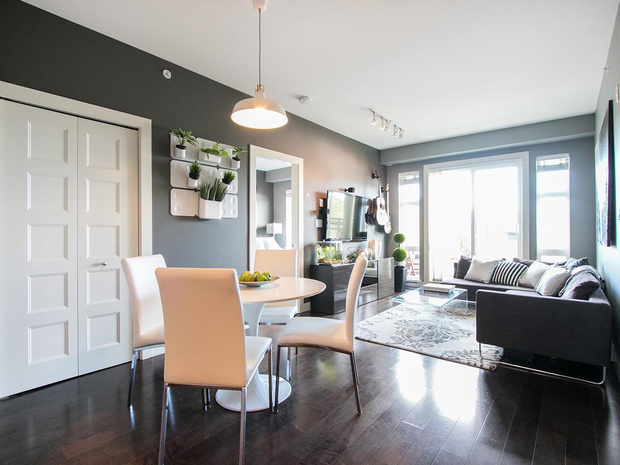 CANNERY ROW - North facing, two level, 1 bedroom loft in Vancouver East. 7.5 ft windows with amazing views of the Burrard Inlet and North Shore Mountains. Recently painted with newly installed blinds. Lots of built-in closet/storage space.This loft at Cannery Row boasts black and stainless steel appliances, including dishwasher, gas range and cozy gas fireplace. Insuite washer/dryer and 2 bathrooms (4 piece and 2 piece ensuite). Common tree-lined courtyard area and shared rooftop patio with BBQ. Solid concrete construction, including demising walls. Secured parking. Listed By: PEMBERTON HOMLES - CLOVERDALE. # 320 2001 WALL ST, Vancouver. See all Vancouver East listings for sale. 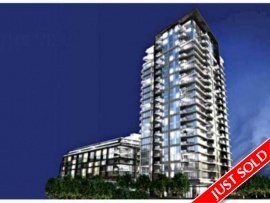 Vancouver east Lofts, heritage suites, and loft style condos starting from $330,000. 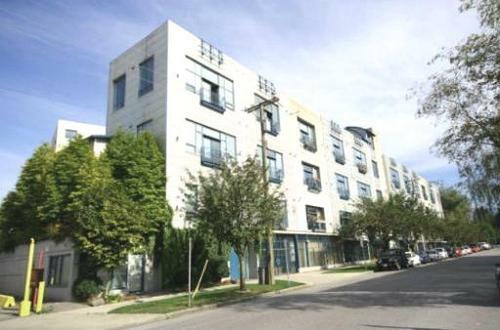 Vancouver east features unique hertiage buildings, two level lofts, and loft converison buildings. 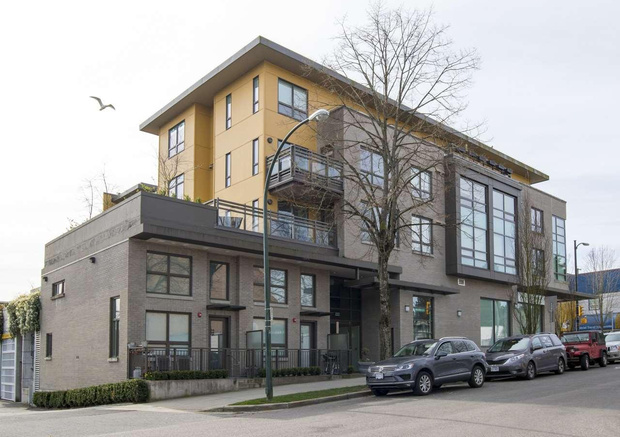 See all Vancouver east listings: hhttp://www.albrighton.ca/vancouver_east_lofts.html - updated daily with new loft listings. 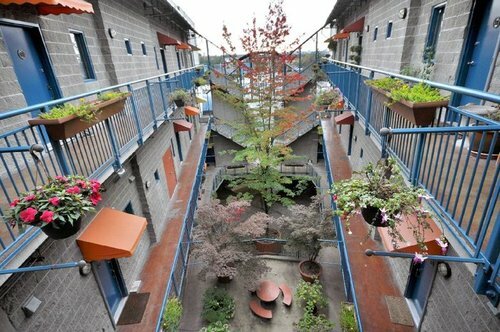 CANNERY ROW - This is a great live/work building located in E Vancouver near Powell St. This concrete metal cladding building features two level lofts with great minimal finishing's Prices Starting from $349,000 for 800 sq.ft. See all the lofts for sale at 2001 Wall St - Canerry Row. Great Vancouver loft building. North facing, two level, 1 bedroom loft. 7.5 ft windows with amazing views of the Burrard Inlet and North Shore Mountains. Recently painted with newly installed blinds. Lots of built-in closet/storage space. Black and stainless st eel appliances, including dishwasher, gas range and cozy gas fireplace. Insuite washer/dryer and 2 bathrooms (4 piece and 2 piece ensuite). 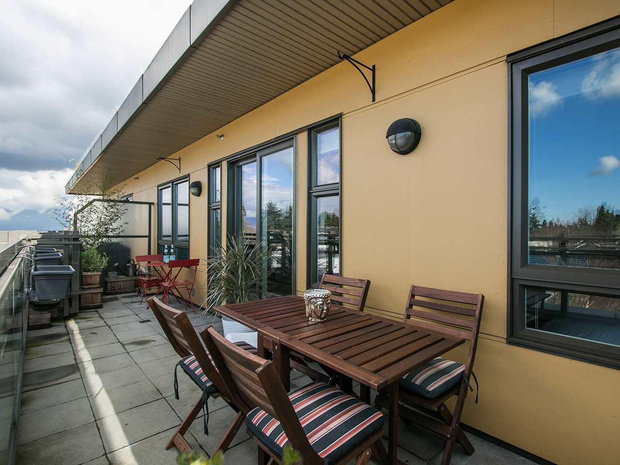 Common tree-lined courtyard area and shared rooftop deck with BBQ. Solid concrete construction, including demising walls. Secured parking.Fantastic view corner ste in Cannery Row. Artist live/work studios. Solid conc c ons rm. Meas approx. Non-reg strata ppty. THE BUILDING - 4 year old, concrete construction, oversized elevator, parking secured underground (one stall with suite), pretty second floor courtyard with tables & landscaping, common rooftop deck with BBQ's & fabulous. Superior custom fin & built-ins in this bright & spacious 2 level loft. Excellen t layout incl 1 bdrm + den & sep office area. Acid etched flrs, multi-media prew ire, built in dining nook & office area. Top flr pf solid concrete bldg. Cannerry Row. community garden and the North Shore mountains. Open floor plan with gas firlace, view balcony, stainless steel appliance and mezzanine extension. Secured underground parking...bike locker...common roof deck with BBQ's and a spectacular water and mountain view...Pets welcomed and rentals OK.